When a winter illness bug gets to you real bad – like it has to me, several things happen as a result. To top the list of annoying ill-effects is the feeling of being constantly drained out and lacking energy. To combat the lack of appetite and a do good a weakened digestive system, I found that I could benefit from a little pick me up! That’s where Horlicks Light comes in – which appears to work well with my many home remedies and an onslaught of daily rejuvenating soups. Horlicks Light has 14 key nutrients including Vitamin A, Vitamin C, Vitamin D, Vitamin E, Thiamin (Vit B1), Riboflavin (Vit B2), Niacin, Vitamin B6, Folic Acid, Vitamin B12, Biotin, Pantothenic Acid (Vit B5), Calcium and Protein. It is also suitable for vegetarians. There is just something very welcoming about a steaming hot mug, loaded with nutrients that make me feel good instantly. Even more so, when it comes with some limited edition Horlicks memorabilia. 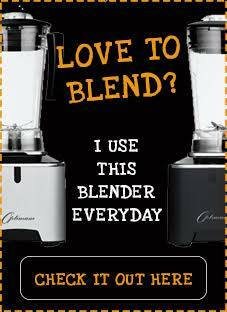 As am sure all of you know, that I am always looking for ways to share the love with my readers. 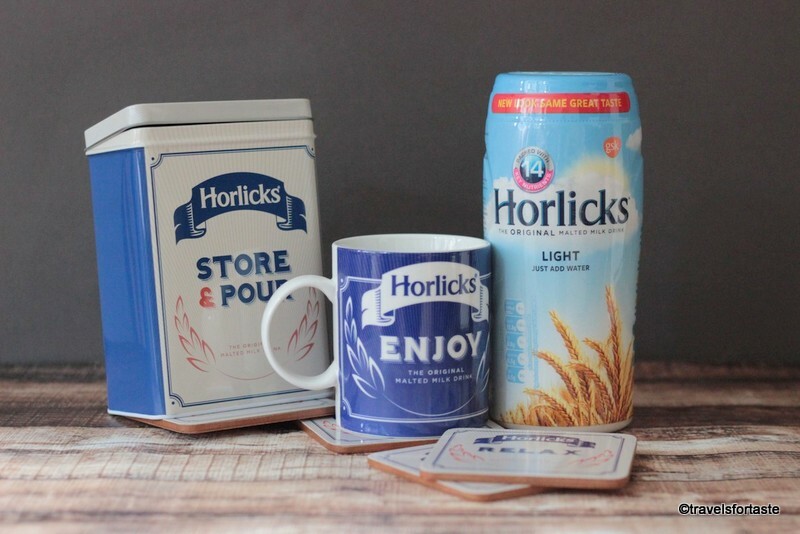 So am pleased to announce, that Horlicks is offering one lucky reader a chance to win a set of this gorgeous limited edition Horlicks memorabilia – a ‘Store and Pour’ jar, a set of coasters, a sturdy and beautiful mug and a 500gm jar of Horlicks Light to get you started. Horlicks Light and Horlicks Light Chocolate have 55% less fat than Horlicks Traditional which means no added guilt for those of you watching your weight. So why not enter this easy giveaway so that when the weather turns grim you can curl up on the sofa with a warm milky drink, to give you a boost for the afternoon. 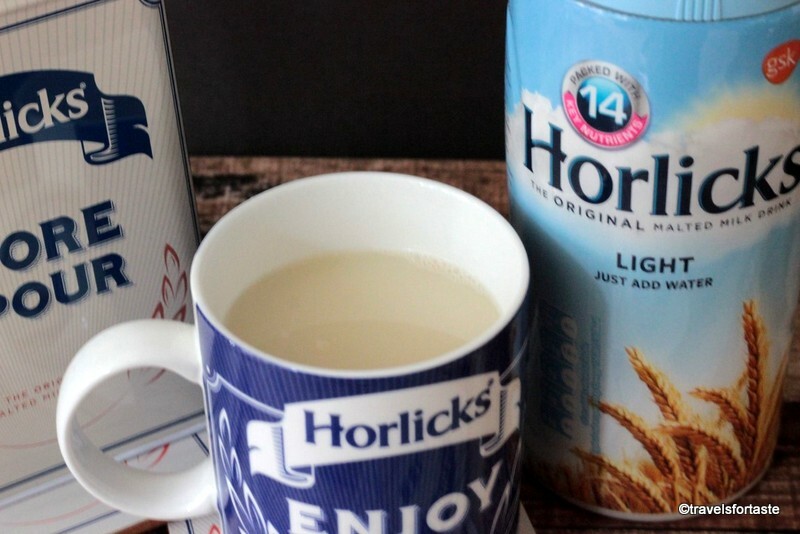 Horlicks is great for those looking for an alternative afternoon cuppa to help boost energy levels! A mug of Horlicks Traditional is packed with 14 key nutrients including Vitamin B6 which contributes to the normal functioning of both the nervous and immune system and can reduce tiredness and fatigue. It is also low fat and a source of protein. And the WINNER is Adrian Bold! ( Twitter id:@AEBold123) CONGRATULATIONS – Please check your email and respond asap, thank you. Deadline for entering this contest is 31st March’ 2016 midnight GMT. Entry is open only to residents of the U.K except Scotland and Ireland. All entrants must be 18 years old and above. ONE lucky winner will be chosen using random number generator. The giveaway prize is as mentioned in the post – a ‘Store and Pour’ jar, a set of coasters, a sturdy and beautiful mug and a 500gm jar of Horlicks Light. Neither Horlicks, nor I am liable for any damage of giveaway prize and / or contents in transit. Please allow a minimum of 25 days for delivery of the prize, which may reach earlier or later. The giveaway prize will be sent directly by Horlicks. The prize is as stated: no cash alternatives are available. I retain the right to DISQUALIFY any entrant who does not complete all the steps mentioned above. 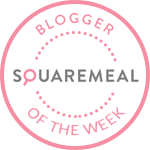 The winner will be notified on 6th April’ 2016 on Twitter by me and here on my blog post. I shall tag the winner on Twitter via their twitter id. If you are declared as the winner you agree to allow me and Horlicks to contact you via email id to arrange for the goody bag to be sent out to you. If the winner fails to respond by 12th April’ 2016 then another winner will be chosen at Random. *With thanks to Horlicks and the PR team for arranging the fabulous gifts and sending me a similar set to sample and for review . No monetary compensation was offered for a positive review. As always all opinions expressed here are entirely my own.